Attack coach Alex King says Saints are determined to put things right at The Stoop today. And he admits the game can’t come quickly enough after the disappointing 24-11 defeat to Wasps at Franklin’s Gardens. 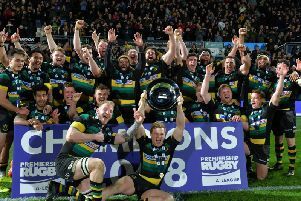 Saints conceded three tries in the opening 30 minutes of that game, slipping to their sixth defeat in 10 Aviva Premiership matches this season. They now sit 10 points behind fourth-placed Harlequins, knowing this afternoon’s clash is crucial in the bid to reach the end-of-season play-offs. “What happened last Friday surprised everyone here,” said King. “We’re so determined to put it right because it was unacceptable for the fans who come and wear the jersey. So how have the coaches treated the players this week? Has there been a lot of carrot, or just plenty of stick? “Every player’s treated individually but you’ve got to look at it for the good of the team as well,” King said. “Everyone’s responded really well, training this week has gone up a notch in intensity and usually when you train with that intensity you play well. “I’m looking forward to seeing how the boys respond and that’s the challenge we’ve set. “It’s just frustrating sometimes that you have to go through those experiences to come through the other side. “But the season’s never a simple thing. There’s always a few bumps in the road and this season we’ve had one or two. Overall, King believes Saints have reasons to be positive about how 2016 has started. He said: “We work incredibly hard and since the turn of the year we’ve beaten Exeter, we’ve won two Champions Cup games, come back really well against Leicester and had a poor first 40 minutes against Wasps. Like Saints, Harlequins are shorn of their Six Nations stars this weekend. And Conor O’Shea’s men will be eager to produce a reaction of their own, having lost their past two matches. “They had a really good start to the season,” King said. “Being in the Challenge Cup has allowed them to rotate their squad a bit more, giving opportunities to guys and freshening guys up who played at the World Cup. “Saying that, they’ve lost their last two games, at Montpellier and Newcastle, so they’ll be eager to put things right in front of their home crowd. “It’s got all of the makings of a great Premiership game with a lot at stake. So is it a must-win for Saints? “We want to win because we want to close that gap on the top four and it’s an opportunity to get four points on the road,” King said.